Steph Swainston burst onto the modern fantasy scene back in 2004 with the first of the Fourlands novels The Year of Our War. While there were some familiar elements, Swainston, much like fellow English fantasy authors like China Mieville, created a new type of fantasy world that was undeniably modern. There were no orcs, no elves, no dwarves and no dragons. Instead, the main character was a drug addicted immortal with the ability to fly, wore t-shirts and jeans and helped to fight a centuries long war against an implacable, insectile enemy. Now, ten years after the last main narrative book and five years after a backstory prequel, Swainston explosively returns to the Fourlands. Following a funeral, the narrative drops straight into the most recent push on the insect-dominated Paperlands. Fifteen years have passed since the events of The Modern World, and after a fair gap, even those who have been following the series probably need a reminder of the key elements of this world, although it’s uniqueness makes these details easier to remember. Swainston and her main narrator Jant, also known as Comet the messenger, acknowledge that it has been a long time between drinks and drop in refreshers of the key facts as needed. And these are that the god-emperor San maintains a Circle of fifty immortals, each the pinnacle of their craft, to help the world defend itself against an invasion of relentless, savage, giant cockroach-like insects. This invasion is coming from outside the reality of the Fourlands and is also happening across a multiverse of alternative realities, a multiverse that Jant can access when he ups the dose of his drug of choice. Aiwans, one of the main races of the Fourlands, have wings, but only Jant is able to use his to fly. Like many fantasy realms, the world of the Fourlands has always been a distorted mirror of our own. But no more so than in this volume which deals with a growing real-world and global issue – terrorism fuelled in part by social inequality. In this case, terrorists take advantage of the invention of gunpowder and the spread of gunpowder-fuelled weapons. It is not clear that Fair Rebel is trying to draw any particular analogies or make particular political points. Only that Swainston uses the rise of terrorism, an activity previously unknown in the Fourlands, to throw the hegemony of the previous books into complete disarray. As with other books in the series, Jant with his world weary narrative takes centre stage. His ability to quickly take himself to different arenas of action make him the perfect guide. At times his narrative is displaced by that of Connell Rose, one of the key conspirators in the well-orchestrated terror plot to bring down the Circle. And underpinning all of the action, the vague stressful understanding that no matter how much it is hated, if the Circle is brought down there will be little stop the advance of the ravenous insect hordes. The Fourlands series continues to take up the cause of “modern fantasy” and remains an inventive and impressive piece of world building. 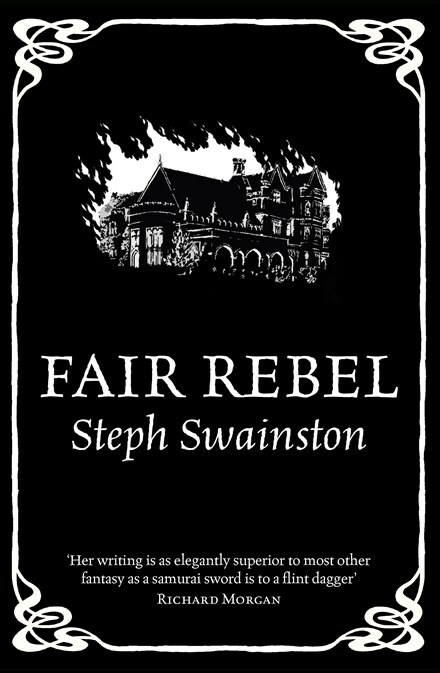 But this is the fifth book in a long running series so while it is designed to be accessible to new readers, Fair Rebel works better as a long awaited continuation of the story that shakes up the status quo and promises more to come with a very open and fraught new reality.